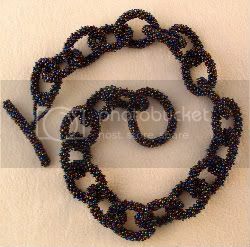 After experimenting with seed bead chain maille, I wanted to take the idea a little further. 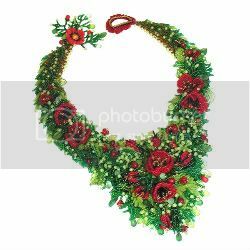 This necklace was made by connecting rings of seed beads, created by zipping up strips of right angle weave. It was extremely fun to make, and opens up all kinds of design possibilities using chain maille techniques. Before trying out more complex designs, I wanted to work more with the tubular RAW. The small right angle weave tubes in the chain maille necklace had a rounded shape, but I wanted to see if I could create a square rope for a simple necklace. I hoped that working with larger beads would help the four sided tube take a more angular shape. To help with my goal of a square rope, I started with 3mm Toho cubes. The smooth edges are ideal for stitching without fraying thread. 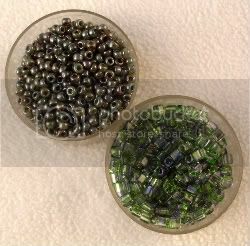 I paired the green/blue cubes with the olive shade “Green Picasso” in 8/o Toho seed beads. The combination is somewhat reptilian, which fits nicely with a beaded rope. Using larger beads made stitching up this necklace incredibly fast. By using cube beads in two rows opposite each other, I was able to get the angled shape I wanted for the rope. I finished it off with a beaded loop and lime green lampwork bead for a clasp. At 16 inches it rests just over the collar bone. I can see it paired with just about any top or dress. Zoya Gutina was born and raised in the USSR, but for the more than 10 years has lived in the United States in New York City and now in Alexandria, Virginia. She holds a Diploma from the College of Culture in Leningrad (now Saint Petersburg), Russia. 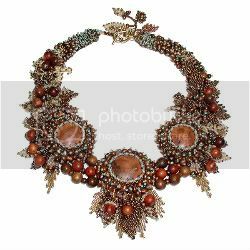 Zoya is an internationally known gemstone and beaded jewelry artist, a blogger and a publisher, a first place winner and a veteran exhibitor in many jewelry design competitions. Over recent years she has developed her own unique style in beaded jewelry. Zoya Gutina is a proud member of the Torpedo Factory Artist Association, the Bead Society of Greater New York, and the Potomac Craftsmen Fiber Guild. 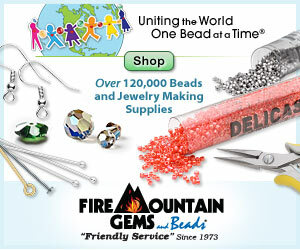 Inspirational Beading: How did you first discover bead weaving? 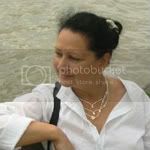 Zoya Gutina: I was born and grew up in the USSR, in a family where all crafts were in a great honor, so I learned sewing, knitting, crocheting, lace making, macramé at the early age. I touched first those itty bitty beautiful things named beads when I was 10 and needed to embellish my ballet practicing dress. I embroidered on the cream-colored dress very pale yellow flowers, and was pretty satisfied with my beadwork. I returned to beadwork about 7 years ago, when I already lived in New York City, influenced by a friend of mine from Russia who showed me some samples of her bead woven jewelry pieces and presented me a few. I was so impressed, that I decided to try bead weaving, and since then I'm hooked on that art. IB: What is your favorite technique? ZG: Though some people contend that bead embroidery allows them more freedom in creativity, I don't think so. Beadweaving has a lot [of ways] to express yourself - it's hard to list all possible techniques and stitches that can be applied to a single beadwork article. As for me, I like netting stitch, peyote stitch, right angle weave, and coral stitch best of all. And, of course, depending on my ideas and designs I use different techniques sometimes incorporating a few of them into one piece. It's very exciting to make my thoughts a reality! ZG: One of my friends called me "nature inspired", and that's true! I mostly find my inspiration when I see blossoming trees and flowers in spring, geometric frozen shapes in winter, or watch beautiful colors during sunrise and sunset. Changing nature stirs my emotions, inspires me and captures my spirit. IB: Do you have a favorite bead color to work with? ZG: To tell the truth, I don't have any preferences, but I would say my favorite colors are any shades of green, blue, black, gray and white, though I like amber, gold and bronze. Some of my beadwork requires pink and red, and I feel comfortable using them. ZG: Oh, there are so many... Diane Fitzgerald and Erin Simonetti are both amazing. 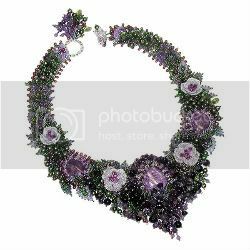 Kerry Slade's floral beadwork is stunning. The Lone Beader always strikes me with her bead paintings. Vampi Choi impresses me with her ability to use multiple colors in one piece of jewelry. You can see more of Zoya’s amazing beadwork on her website My Lovely Beads. 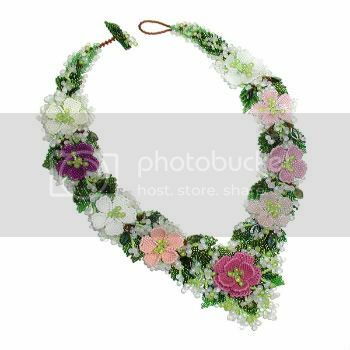 Her designs range from vibrant strung necklaces to intricately detailed collars, and more. 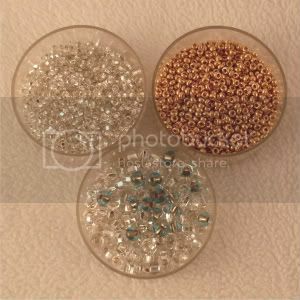 You can also check in with her inspirations and other beading and jewelry topics on her blog Gem and Beaded Jewelry. On March 28th, millions of people all over the world will be turning out their lights to raise awareness about climate change. Earth Hour was started in Sydney Australia, and after just one year the number of participants went from 2 million to over 50 million. This year the numbers are even greater. When it comes to raising topics about the environment, there are so many ways to get people talking about the issues. Beading is one of them! If you’re an eco-friendly beader, why not make something for the Earth this month? You could use green, blue and white beads to represent the globe, buy some tagua nut beads for a sustainable project, or plant some flowers for the bees and then recreate them with beads. And don’t forget to turn out your bead lamp for Earth Hour! Being environmentally friendly is becoming more and more important for business crafters. Our customers want to know that our products are good for the Earth. As beaders, it’s not easy being green, but it’s well worth the effort. One of the commitments I have made since declaring myself a jewelry designer is to swear off metals whenever possible. I’ve been against the use of gold in jewelry for a long time, but I also try to avoid silver and nickel, too. After writing The Truth About Gold - an article about the hazardous effects of gold mining - I decided to do an experiment to see if I could mimic authentic gold jewelry using seed beads and no metals. So, I grabbed a sketch pad and started browsing the websites of some popular gold and diamond jewelers in North America. I saw a lot of gold chains: some plain, and some with dangly things hanging from them. It wasn’t very inspiring at all. Finally I came across a photo that made my inner magpie sit up and pay attention - a charming little gold and gemstone Y style necklace. It was made with a set of gold rings covered in multicolored briolettes, suspended from a simple gold chain. 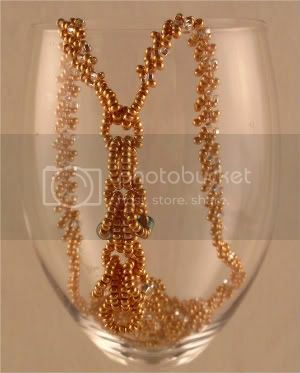 With my inspirational necklace found, I set out to recreate it with seed beads, and a touch of my own style, too. I decided to add a touch of diamond to the necklace, so I paired galvanized metallic gold beads with crystal foil-lined beads in 10o and 6o. For a splash of color, I also added some foil-lined blue 6o seed beads. The briolette necklace I had found had much more color, but I didn’t have any other 6o foil lined beads. I wanted the beads to be uniform, so I opted not to add other styles of 6o’s. To make a gold chain, I used basic St. Petersburg Chain, adding in a hint of “diamonds” here and there. The chain is stitched in two parts, with the top ends connecting for the back of the necklace. Beaded loops connect the chain and pendant at the front. Taking a little further inspiration from Sheryl Yanagi’s Byzantine seed bead chain maille, I added a pendant of seed bead hoops with diamond and sapphire “gems”. In the end, this necklace looks almost nothing like the piece that I drew my inspiration from. However, I think that I was able to achieve my goal of making a necklace that would look right at home in an expensive gold jewelry showcase. Now only one question remains. 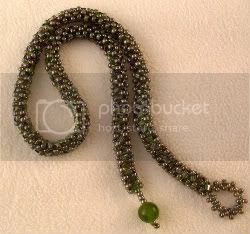 Why would anyone spend so much money on dirty gold when green beads are just as beautiful?